Waking up in Travelodge we decided to get up and out before breakfast to head for Dungeness. It meant a drive down through Kent and we wanted to travel so we could enjoy the countryside. The weather was supposed to deteriorate over the course of the day, so an early start was advisable. Google offered us a couple of quicker alternative routes, but we gracefully rejected them and set off on a winding route, through a string of red brick villages. Google was not willing to accept our decision and kept telling us to get back on message with the quickness thing. Time and time again we were forced to restate our preference and each time it said forcefully, we are redirecting you back onto the M20. An early mist looked like burning off and maybe producing enough sunshine for us to get down to Dungeness before the rain. Eventually Google admitted defeat against our determined resistance and let us travel along hedge lined roads, past inverted funnel roofed oast houses and fields of sun worshipping solar panels. An hour later and the landscape had not only become flatter, but began to look like it was once part of the sea, which is somewhere just out of sight at this point. It reminded me strongly of the Solway coast in Cumbria, where the sea and land fight a constant battle for ownership of territory. Romney is long associated with the marshes, but the Dungeness part of the coastline, is where the sea has pushed millions of tons of small rocks out of its way as it moves up and down the English Channel. We came to see the garden created by Derek Jarman on the shingle beach, almost within the long shadow of the nuclear power station. We have been looking at photos of the garden for years and are aware that it is not like other gardens in that it is both not open to the public and also in full public view. To see it, you just drive along the coast road with the shingle, or small stones spread out on both sides. Crossing the single track railway, the feeling that this is the edge of the world was heightened by the decidedly transient feel to the wooden beach hut homes, dotted almost randomly alongside the narrow road. On one side the shingle rises slowly to the horizon, before sloping down towards the invisible sea. Only the beached boats and nets gives its proximity away. 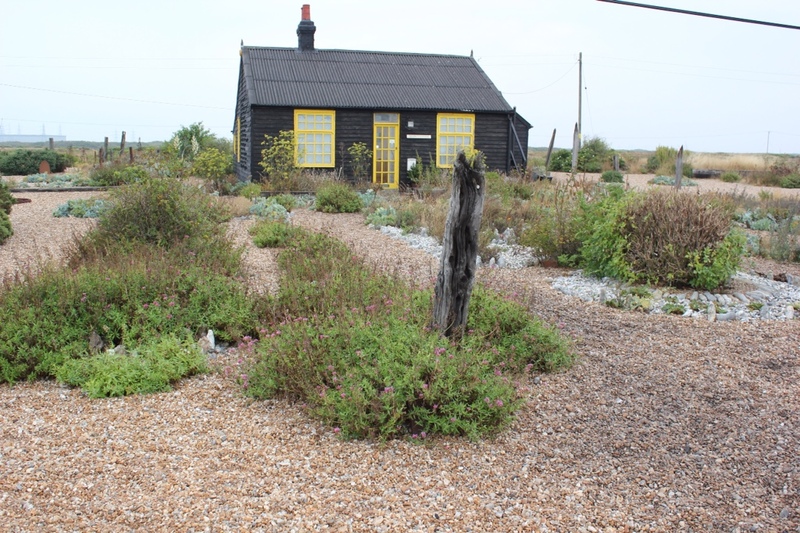 Prospect Cottage is not open to the public because it is the home of Derek Jarman's partner. It can be easily recognised by the liberal use of bright yellow, contrasting with the traditional black painted walls and roof. Peer closely and you can see the words of John Donne's 'The Sun Rising' picked out in carved letters attached to one side of the single storey building. Trying to explore the garden without appearing to be a stalker, is a tricky balancing act to perform, but I think we did it. At that time of day we were not really going to disturb anyone, but we did our best not to be intrusive and made sure we did not encroach on the unfenced garden itself. From the road you can see most of it, although approaching it from the side, it is difficult to see the overall structure, especially as the planting seems very much like the natural flora of the roadside verges, the sea kale and grasses that hug the salt and wind whipped landscape all around. Many people have remarked upon the wildness of the garden and its lack of formal structure, but when you look carefully, all the elements of a traditional garden are there. There is a mix of hard and soft landscaping, distinct beds and even a semblance of individual 'rooms'. There is a distinct route through it and a mixture of heights to add interest and perspective. It most effectively borrows from the landscape around it as all the best gardens do. 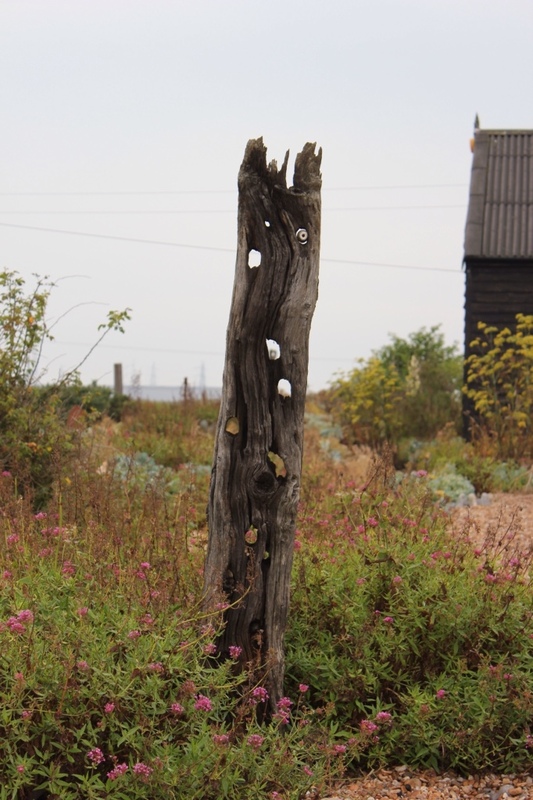 The choice of plants is probably even more linked to the environment than many other gardens, but even then, Derek Jarman was well known for bringing back plants from other places and adding them to the local flora. The pieces of wood and other flotsam and jetsam, carefully placed, serve the same purpose as any statuary might in any other context. Plus there is a lot of humour, something missing from the National Trust idea of an English garden, but very much a link to Geoff Hamilton's views of what is acceptable. Here there are things like the piece of timber punctured with small holes, through which you can see parts of the garden, that seems to have an eyeball jammed in one of these looking back at you. There are island beds of pointed rocks, the like of which we later that day saw in a contemporary art gallery. There is the poem, in black on black, chiding the sun for having the temerity to poke itself through windows to wake the lovers inside. Yes it was inspiring and because we also felt like intruders, we slipped away, hoping to have left less of an impression on sleepy Dungeness than that 'busy old fool'. It was time for breakfast and having found out from the man at the nearby fish emporium, that the nearest pint of milk was two miles away, we retraced our path back to the main road along the coast towards Folkestone and our destination, Margate. Most of the larger houses are arranged in a line facing the sea, although as you move towards Dymchurch there are more settlements with roads off the main drag. The further we got along the coast, the more substantial the sea defences became, until it was impossible to ignore the threat that people here have lived with for centuries and which caused such destruction and death here some sixty odd years ago, when a combination of high tides, low pressure and high winds brought the sea inland at many points along the eastern coast, at the narrow point of the North Sea where it is squeezed into the English Channel. We were guided around most of the coastal towns and cut across the Isle of Thanet to Ramsgate and Margate. Google once again interfered with our plans. Despite putting in the correct postcode for our Travelodge, our guide took us nearer to Ramsgate than we intended and then left us at the top of a backstreet in an alley without any explanation. I assumed an error on my part and re-keyed the postcode, but it pointed to the same spot. When I re calibrated, using the full postal address and our current position, it found the correct destination. At which point Christina noted that her mother had once lived very close by in Ramsgate and the address we were at was eerily familiar. 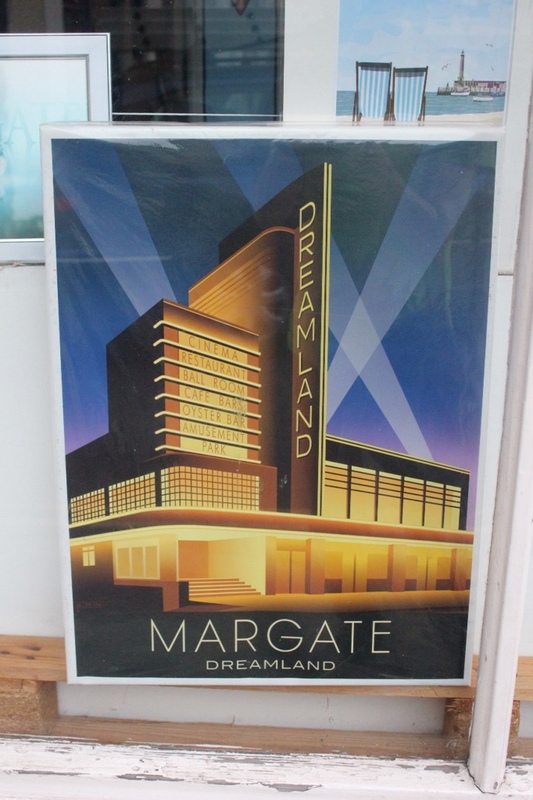 Margate is one of those towns perennially regrouping around a different concept of what it wants to be, compared to what it once was. Hence there is always a little bit of the old, a bit of new and a lot of empty in between parts. The Turner Contemporary is a healthy addition to the town, more invigorating to the soul than the marquees on the beach imploring people to get fit and active, with their equipment for windsurfing and sports development teams. 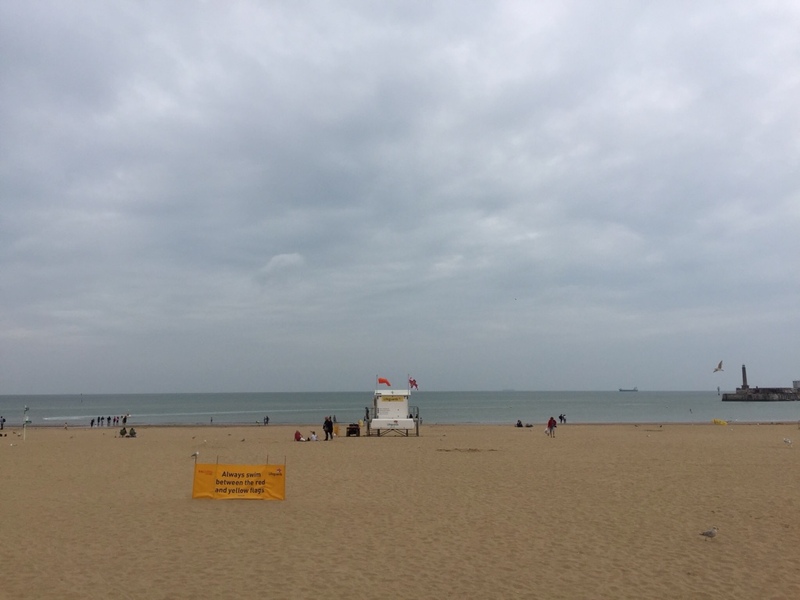 There were few people here at the peak of the summer holiday in the amusement arcades and none in the tidal pool down on the beach. 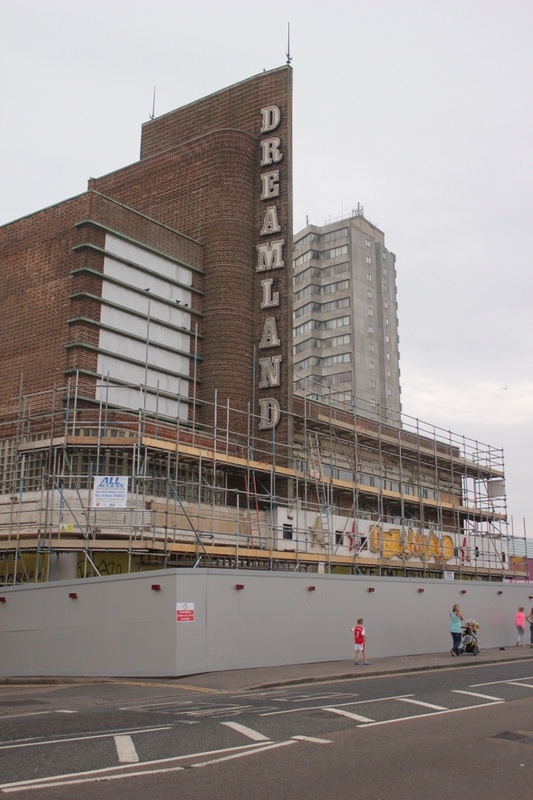 The beach itself is lovely and still the best reason to come here, but the sight of 'Dreamland' with its scaffolding and air of yesterday's solution to what the seaside town should be, made for a poor contrast. 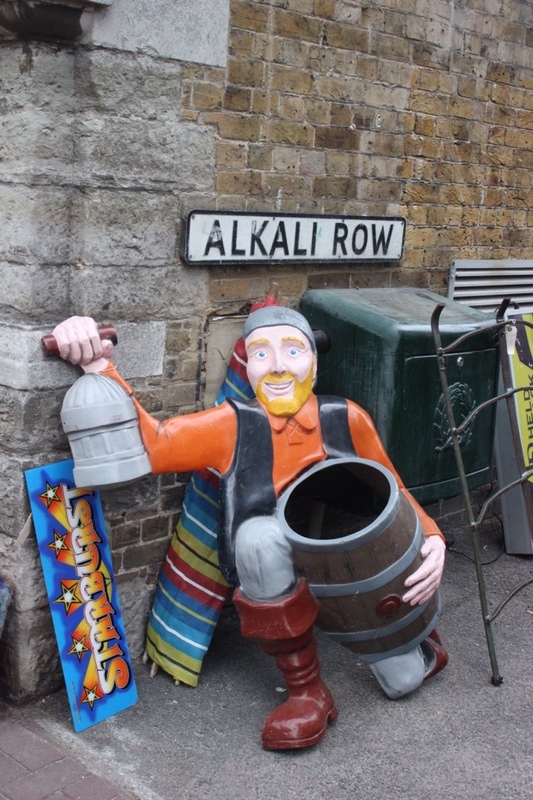 There are pockets of promising developments here, including the 'just down from London' feel of the small art galleries and retro, upcycled and quirky, fashion and home decoration shops down some of the narrow lanes. There aren't enough of these to join up as a community and a few too many empty places in between to make it a 'quarter' yet, but it is a start. Otherwise, the fact that, when asked where to buy a pint of milk or a warm top to cover up against an onshore wind, locals directed us up to the massive out of town shopping centre, straddling a lot of the land between Margate, Ramsgate and Broadstairs, says a lot about the problems the old town centres have in attracting spending sufficient to encourage investment there. And that's where our hotel was. Waking up in a tent, back in 1976, we found that sitting up, or even the slightest movement brought a sprinkling of water down on us from the single, orange nylon roof. Trying to get out of the tent without touching the condensation was impossible. Once we had unzipped the tent flap, we were both relieved to discover no Boy Scouts either in their tent or around the camp. We needed drinks, food and a wash after our experiences of the day before. The first two not being available, we decided to go native and waded into the river beside the campsite. We were not intending to strip off anywhere we might be seen by our neighbours, so rolling up trouser leg I waded out. Christina hitched up her nightie and followed. There was quite a lot of squelchy mud wherever we trod and the water did not look deep enough to wash in. We intended to go far enough to be able to at least wash ourselves of the dust and whatever from yesterday. After a while, Christina turned to me and said, pointing at the water around her knees, “look fish”. There were indeed bubbles rising through the water, but on closer inspection and looking around at what was actually floating on the surface, I suddenly realised what we were facing. “That's not fish”, I said. “That's sewage”. It was indeed methane or something like it we were disturbing on the river bed. It was also then we saw the end of what appeared to be a sewage outflow pipe. We turned to rush back to shore. At that very moment a train rolled past on the track we had walked down to get there. All of the passengers on our side of the train were treated to the spectacle of a half naked man and a woman with a white Laura Ashley nightdress, trudging through raw sewage. Back to camp and opening our tent, we were faced with hundreds of flies that were buzzing around inside, turning the near see through roof black with sheer numbers. We needed to get changed, but were absolutely filthy, stinking and wet. There was only one thing for it and we did not hesitate a second, before grabbing the large container of drinking water belonging to our absent neighbours and hosed ourselves down with it. We dressed, packed our bags, dismantled the tent and tore back down the rail track to the safety of the road in a few minutes. We stopped crying at some point, but it nearly brings tears to the eyes reliving it to this day.